The Teton is one of the largest rambler home models our company offers. It has a total square footage of 5,016 and a finished floor area of 2,514 square feet. 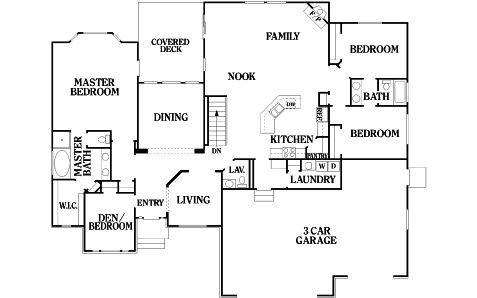 It comes with 3 bedrooms (one of which is a master suite), 2.5 bathrooms, a formal living room, and a formal home office/study. It even features a covered deck, a dining area, a separate living room, a cozy nook, and a spacious family room that’s connected to the kitchen. What’s more, it boasts an expansive garage that can fit 3 cars, making it the perfect home for large families. Perry Homes is your trustworthy heritage home builder in Utah. Our company has been in the business for more than 40 years, and we offer low-cost rambler and two story style homes that can accommodate every household. We pride ourselves in delivering quality services and an excellent and stress-free house buying process because we believe that constructing your dream home shouldn’t be difficult. Plus, our lines are open even during post-construction to ensure that your new house remains in tiptop shape. Contact Perry Homes and let’s start building your dream Utah home today. Our agents will be more than happy to give you more information on our Teton home, as well as our other rambler and two-story models. We also offer transparent financing options to help you secure great financing for your new home. Please give us a call at 801-264-8800 to get more details.